TOYOTA GAZOO Racing is prepared and positive ahead of the 84th running of the legendary Le Mans 24 Hours, the highlight of the 2016 FIA World Endurance Championship (WEC) season. TOYOTA enters Le Mans for the 18th time, having made its debut in 1985, and travels to France looking for its fifth podium finish at the Circuit de la Sarthe, having recorded a best result of second four times. In the driving seat of the #5 TS050 HYBRID will be 2014 World Champions Anthony Davidson and Sébastien Buemi joined by Kazuki Nakajima, who set the pole position time at Le Mans two years ago. The #6 car features three-time Le Mans pole winner Stéphane Sarrazin alongside Mike Conway and Kamui Kobayashi. The battle with former winners Audi and Porsche sees the new-for-2016 TS050 HYBRID compete at Le Mans for the first time. The 1,000hp prototype has been optimised specifically for this race and features significant upgrades compared to the TS040 HYBRIDs which finished sixth and eighth last year. Intense development of the new 2.4litre, V6 turbo engine at Higashi-Fuji technical centre in Japan has delivered an efficient and powerful powertrain when combined with the battery-based 8MJ hybrid system. In parallel, a new chassis has been developed for 2016 at TOYOTA Motorsport GmbH in Cologne, with almost all parts redesigned and optimised for weight and performance. A low downforce aerodynamic package will make its race debut at Le Mans following a successful test at the Circuit de la Sarthe last weekend. TOYOTA travels to Le Mans determined to build on the race-winning pace shown in the last WEC race at Spa-Francorchamps, where the TS050 HYBRIDs looked on course for victory until engine problems struck. Thorough investigation of the data has established that the issue was specific to the Spa circuit, caused by the car ‘bottoming’ through the undulating Eau Rouge corner. Despite the disappointing end result in Belgium, the overall speed of the TS050 HYBRIDs has raised the team’s hopes for Le Mans, where it expects to challenge at the front, inspired by the goal of winning the race for the first time. The official test on 5 June raised hopes of a closely-fought race. The fastest TS050 HYBRID recorded a lap 2.124secs faster than the best TOYOTA time from the 2015 test, despite a 10% reduction of fuel consumption required by regulations. 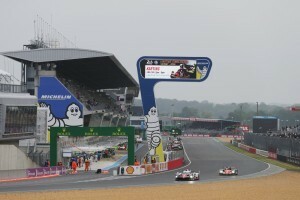 Both cars demonstrated reliability, completing a total of 177 laps, 2412km. Endurance is equally important as performance at Le Mans, which features almost 35 hours of driving until the chequered flag waves, starting on Wednesday 15 June with a four-hour practice session at 16.00 before 120 minutes of qualifying begin at 22.00. Qualifying continues on Thursday with another pair of two-hour sessions (19.00 & 22.00). The starting grid is decided by the fastest single lap from any of the qualifying sessions. The traditional drivers’ parade in the city centre on Friday afternoon gives fans a unique chance to get up close to the drivers before race weekend, which begins with a 45-minute warm-up at 09.00. The race starts at 15.00 on Saturday.